Bear with me a minute as I’m not saying Italians shoemakers are old fashioned. 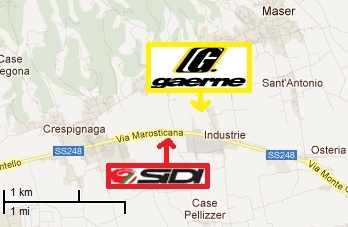 Instead here’s a quick explainer on cycling shoemakers Sidi and Gaerne and their surprising similarities. Sidi began trading in 1960, that’s the first HQ in the photo above. It made hiking boots but within a decade moved into production of cycling shoes and motorcycle boots and today the brand is equally famous in cycling and motorsport. It’s based in the small town of Maser, a place of just 5,000 people in north-east Italy, in the Veneto region. Similarly Gaerne also makes cycling shoes, motorcycle boots and hiking and hunting boots. It too is based in Maser, in fact just a few hundred metres away from Sidi’s factory. Sidi was founded by Dino Signori. Take the first two letters of Dino and the first two from Signori and what have you got? Di and Si. Flip them backwards: Si-di. Gaerne was founded by Ernesto Gazzola. Take the first four letters of Ernesto and first two of Gazzola to get Erne and Ga. Flip them backwards: Ga-erne. Obvious when you see it, no? If they come from the same town and share similar naming techniques this is not just coincidence. The Veneto region is responsible for 70% of Italian sports shoes and it’s home to the likes of other cycling shoemakers like Diadora (owned by Geox) and Northwave. 80% of Italian sunglasses come from the region, it’s where Luxottica was founded, the Italian company that today owns Oakley and Rayban. Brands like Benetton, Diesel, Marzotto and Stefanel come from the region. Pinarello is just a spin away from Sidi and Gaerne, Willier Triestina and Campagnolo are nearby too. Indeed much if Italy’s economic wealth – it is the seventh largest economy in the world – comes from businesses like Sidi and Gaerne. They are perfect case-study examples of businesses that started in Italy’s post-war boom, that remain family-owned and rely on craftsmanship and design to export a large share of their production. A perfect example of why this blog remains so fresh and interesting! I’ll never look at my SIDI shoes the same again. Interestingly, Sidi was a men’s suit line developed during the 70’s by Italian clothing giant Gruppo GFT. It heralded the move from ‘made to measure’ to ‘off-the-rack’ attire designed for the masses. Wondering if all this was due to an industrial movement in Italy? Another interesting piece. I can recommend the Museo dello Scarpone in Montebelluna, right at the heart of the Veneto’s sports system/shoe making area – it’s amazing the household names based in and around a very small area. The museum has a great collections of ‘famous’ footwear – it’s been a while since I went but I’m sure there were Mario Cippolini’s Northwave shoes and various others there. I recall Alain Prost’s racing boots and Alberto Tomba’s ski boots among many others, all originating from the local area. Website is http://www.museoscarpone.it for those interested. Giessegi = “GSG” in Italian = ? Im pretty sure that GSG are the initials of the original partners of the company. Only Simone Fraccaro remians today..
SIDI shoes are one of a kind. I really love mine and the last really a long time. Italians LOVE to write the initials for some reason. Our friends in Bergamo have a small publishing company named Effepierre (FPR) which are the initials of the first names of the three principles. A list of companies like this in Italy would almost be endless. On the shoe side, our friends at Vittoria Shoes (no relation to the tires) http://www.vittoria-shoes.com/ make theirs on the opposite side of Italy, in the far west. Biella is the hometown of the founder Celestino Vercelli who has made shoes (after his pro career ended) for Cipollini, Roche, Kelly, Pantani and plenty more. I believe they still live right on the premises. Another big area for shoes in Italy is Le Marche, home of Marresi, who (I believe) no longer make cycling shoes – I think they gave it up when clipless pedals became popular, rather than redesign their shoes. ( Disclaimer: Vittoria Shoes is an official supplier to CycleItalia. There’s been a lot of economics/business research into northern Italy’s industrial clusters. A couple more worthy of mention in the same area are Selle Italia and Selle Bassano. @936ADL – could not agree more with your comment about the blog (don’t own any SIDI shoes although I’ll certainly look at them in a new light next time a purchase rolls around). Marresi stopped making cycling shoes only about 2 years ago. They are based in Marche, not Le Marche as anglophones seem to insist on calling it. They made carbon soled shoes for clippless and were well know in the Italy particularly that region. The even sponsored pro riders on the Naturino Team (another shoe company) a few years ago. Their shoes were as good as Gaerne and Vittoria but operating a small family based company they could not compete. Like many shoe companies they struggled or shut down, however the region is still a top shoe producer in Italy. Down the road hidden in a small town is another famous Italian cobbler called Corvaro. He designed the first floating cleat for toe clips, and made shoes for Colnago i.e Eddy Merckx, Van Looy, Sarroni. You can still buy his shoes custom made right from his factory but you will never find them outside of Italy. Very exclusive. Good reading as ever, never knew about this. Ferrari, De Tomaso, Lamborghini, Pagani and Maserati are all in and around Modena, IT. Another concentration of design, skilled labor and technology. There are so many good companies in Italy, and not just the cycling trade. Arrange it in advance and many will show you around the factory. Larry T. that’s an old link you found. they don’t produce cycling shoes any more. Google doesn’t have all the answers. thanks for the interesting article. Another cool article would be to look at the interaction between all these Northern Italian companies. Colnago and Ferrari collaborate on bicycles. http://www.colnago.com/ferrari/ Sidi’s carbon soles are made by a small factory in the Dolomites that also makes Ducati and Ferrari parts. Interesting post, sore point for me personally, is not being able to get replacement lenses for my BRIKO glasses,here in the UK, there is no longer an importer (used to be JIM WALKER) have had SIDI’S,( pre clipless) great shoes, now have mix of DIADORA and SHIMANO prefer the DIADORA. Yes some great stuff comes out of ITALY. Thanks RiderCouncil, but the Marresi link you provided doesn’t say much other than “under construction” when I went there. I assumed that a company would take down the pages showing cycling shoes if they no longer made them, how is that mine or Google’s fault? As to Marche, when I write it that way I get folks saying it should be Le Marche and when I do it that way I get folks like you complaining. Maybe I should have gone full anglophone and written The Marches? I always wonder why folks write Sardinia instead of Sardegna, but what do I know? It’s no different with the saddle makers in Italy. They are all in the North Eastern Italy by Venice. They may not be across the street from each other but it is strange how similar Italian manufactures seem to locate near each other. I don’t quite follow your logic Larry T? Google can be you friend if you use him correctly, there is a number on that site, call it. I live in Marche so what would I know? Anyway 500 bucks for a pair of cycling shoes is nothing if you consider just how important a role they play. If you look at what you can pay for a pair of wheels these days and you would be lucky to have those for 10 years. Current cycling shoe design is obsolete and apart from buckles and material choice there is very little difference fundamentally between one top brand and the other. Sidi have not changed there basic design for well over a decade. I think it’s time the cycling shoe got a serious rethinking. A lot of power is already lost at the pedal because of stock shoes no matter how hi tech they seem. The only companies having a stab at custom are skate companies and they are not doing a good job, otherwise we would all be wearing them. If they go it right, once you go custom you will never go back. I’ve been wearing Gaerne for 4 years, before that Sidi and Specialized. My Gaerne’s are the best I’ve ever owned. Fit with shoes is highly personalized but I’d be lying if I didn’t say these are the best fitting shoes I’ve ever worn on the bike. Very similar to Sidi, but better in my opinion. If you are interested in a pair, the US importer, GizmoGear would likely love to help you out. Be sure to ask for Larry. That is a beautiful structure, more museum than factory. I have to wonder how that makes sense economically. Funny how the decades come and go & brand popularity come and go..
the one I find funny is Kelme in Spain , they make nice sport shoes for football in particular , had a pro cycling team for decades even a podium at the TDF but never produced a cycling shoe, well not for the International market. Why are the “traditional” cycling reporters so far behind in content of this depth? Not Italian or cycling but I believe Adidas and Puma are across town from each other and New Balance and Saucony are both in the Boston area. These shoemakers seem to stick together. The co-location is not really that odd, it is often down to the skilled labour involved. Most of the denim jeans made in the UK all used to be made in North Wales, Huit Demin have just restarted making jeans there. My road Sidi shoes are made in Romania, not in Italy. It’s clearly indicated in the shoes themselves. same happens with Campagnolo. Italians are using eastern europe just like others use China. So,not so romantic anymore, but i couldn’t care less actually. Please update your information, cause it’s not exactly as you wrote it anymore, things are changing in europe quite fast. Campagnolo chose Romania because of the ability to maintain higher quality control. All those small companies in Northern Italy are fanatical about quality control. How long before transport costs push up prices for the likes of SRAM and then the likes of Campagnolo become attractive again for the youngsters?